Six performance measures were used to assess their policies and practices on the economic, environmental, social and governance (EESG) issues: lifecycle management; business conduct; community wellbeing; working conditions; environmental responsibility; and economic development. The findings were based on 30 publicly listed, state- and private-owned companies from 16 home countries. They include AngloGold Ashanti, ArcelorMittal, BHP, Bumi Resources, Coal India, Exxaro Resources, Freeport-McMoran, Gold Fields, Rio Tinto, Vale and Zijin, among others. Up to five mine sites were selected from each of these companies. The mine sites that were specially chosen are located in emerging and developing economies, where high levels of inequality persist. The report took on the perspective of what the society can reasonably expect of such large mining companies. 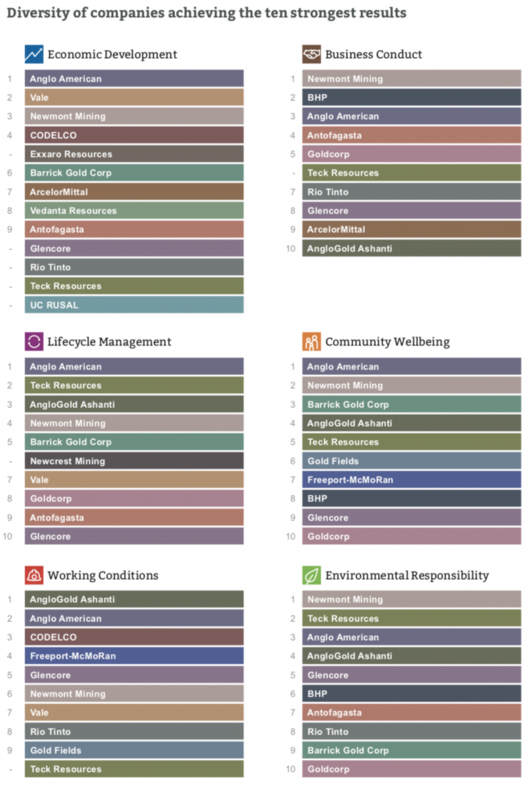 Compared to other thematic areas, business conduct shows the highest average score. This is primarily due to the fact that the majority of companies have made some level of commitment on business ethics and anti-bribery and corruption. Out of 30 companies assessed, Anglo American, Glencore, Newmont Mining and Teck Resources consistently performed in all the six thematic areas above. But only Anglo American came out as the top-three strongest performer in each of those indicators consistently. All 30 companies performed fairly similar in two areas — business conduct and working conditions — as most companies have taken actions to demonstrate their commitments to business ethics and to occupational health and safety (OH&S). In terms of economic development, Anglo American, Vale and Newmont Mining significantly outperformed their peers — measured in the efforts to ensure their investments and activities catalyse socio-economic development beyond the immediate vicinity of their mine sites. The result found that performance did not necessarily depend on company size, commodity focus or geographic location. While the companies showed various stages of maturity in managing EESG issues, the report showed that there is still considerable scope for improvement. All thirty companies are encouraged to pay special attention to involving mining-affected youth in community activities; to honour human rights defenders; to track company performance in meeting or exceeding living wage standards; to disclose the contracts, licenses and agreements that are granted to them by governments; and to ensure a just transition for workers in the event of mine closure. The Responsible Mining Index (RMI) believes that minerals and metals mining should benefit the economies, improve people’s livelihoods and respect the environments of producing countries, while also benefiting mining companies in a fair and viable way.